The traditional Style with today´s modern amenities. 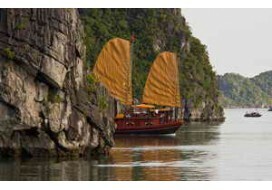 The Lagoon Explorer I & II are the first and only junks on the Bay which can really sail! Built for expeditions, you can truly go to any corners of the Bay. Whether you are dinning in the restaurant, louging on the sun deck or relaxing in the comfort of your cabin, you will be surrounded by the handcrafted woodwork of teak and oak which make the Lagoon Explorer Junks a true masterpiece. 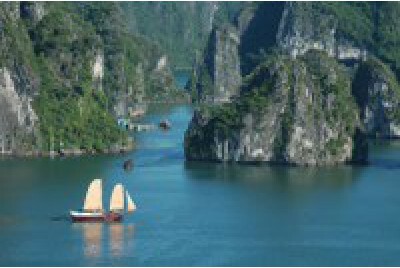 Explore the beauty of Ha Long bay in your style with Lagoon Junks, we bring you a fantastic trip with many animated activities as cruising, kayaking, visit the floating village, swimming and discover the karst caves. The Lagoon Junk boasts its deluxe facilities as indoor & outdoor restaurant with a mini-bar but can serve you various different cocktails & beverages. The junks each have one deluxe & three other cabins room, a fine dining restaurant & bar, an outdoor lounge, a swim platform, a well trained crew, 24 hour electricity supply and a host of activities to make your stay memorable. All of our deluxe cabins are equipped with air conditioning, linen bedding and western style bath with hot shower. The harmonious combination among wooden carvings, wooden mini – bar and lantern inspires customers’ classic impression. 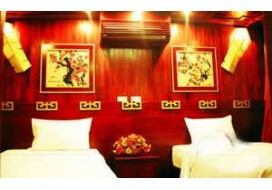 This traditional style combines with modern facilities make the visitor feel comfortable and convenience. Whenever you can relax in your room and enjoy the splendor of the sites through panoramic window.